Slight waves are added to the sides and back of this style to give it movement and shape. This casual 'do is easy to re-create with the right tools and needs product to tame fly-away hair. Regular trims will also help maintain a healthy look and feel by preventing split ends. Gemma Aterton has striking facial features and an square face shape with a strong jaw line, which is softened up nicely by her waved layers here. Voluminous hairstyles that have lots of body and volume around the jaw and neck area are ideal for her as they balance out her face shape and low forehead the best. The blunt cut ends give her hair a thicker appearance in addition to added body and volume, which is important for her fine hair type. A side part finishes this 'do off with a chic look and balances out her jawline. Gemma has a warm complexion with amber eyes. This coloring is best paired with brunette, auburn or red locks. Here, she goes for an chestnut brown base with some subtle golden highlights throughout. This color works nicely with her complexion and gives her an all-over warm glow, while bringing out her adorable freckles. 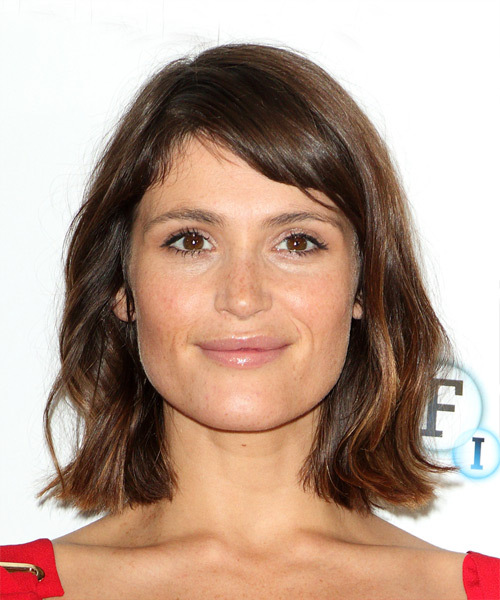 Gemma Christina Arterton is an English actress. Arterton made her film debut in the comedy film St Trinian's. Use a round brush to flick out the ends while drying.